Retired South African referee Jonathan Kaplan says the decision to award a last-gasp penalty against the All Blacks in their loss to the Springboks sets a dangerous precedent. First five-eighth Pat Lambie slotted a 78th-minute penalty to hand the hosts a 27-25 win in Johannesburg on Saturday, after All Blacks flanker Liam Messam committed a high tackle on opposite Schalk Burger. Kaplan, who whistled a world record 68 Tests, says the tackle deserved to be penalised but he was concerned about how the incident came to the attention of referee Wayne Barnes. 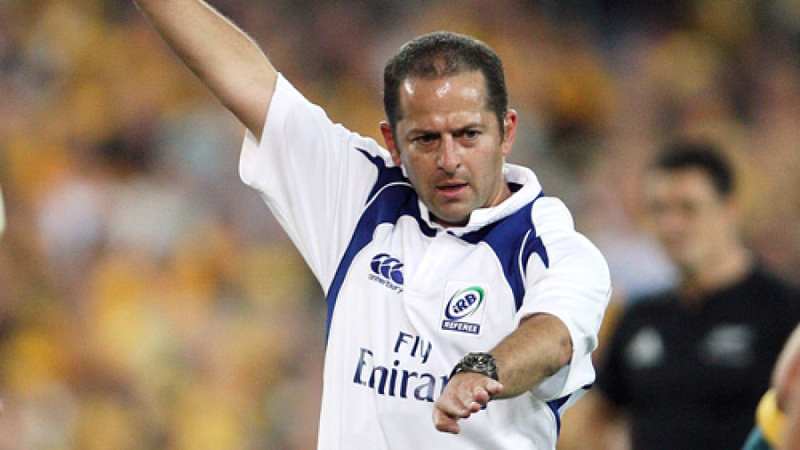 Writing for the website ratetheref.co.za, Kaplan noted Barnes and his assistant referees all missed the tackle, which was then brought to their attention by broadcasters who controlled what was shown by replay on the big screen at Ellis Park. "After finding the clip, and then replaying it over and over, eventually the match officials decided it was worthy of review, and correctly awarded a penalty to the Boks," Kaplan said. "I doubt [very much] whether that clip would have been brought up on the screen by producers in Aus or NZ and replayed over and over. "Is it right that someone outside of the domain of the match officials can affect the outcome of a major Test match? And how neutral is he?" Kaplan had few concerns about other aspects of Barnes' game. He even handed the Englishman praise for a surprisingly good rendition of American singer Don McLean's Bye Bye Miss American Pie at a barbecue he hosted earlier in the week. "So much for those people who regularly say the Northern referees are not up to it!" However, Kaplan wasn't as complimentary about Welsh referee Nigel Owens, savaging his performance in the other Rugby Championship Test on Saturday in Mendoza, where Argentina beat Australia 21-17.